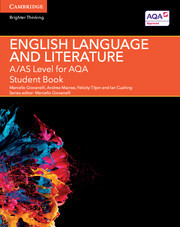 Created specifically for the AQA A/AS Level English Language and Literature specification for first teaching from 2015, this Student Book and digital bundle offers stretch opportunities for the more able and additional scaffolding for those who need it. 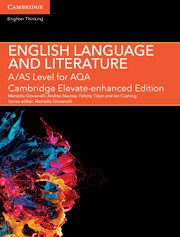 Providing full coverage of the specification, the three-part structure bridges the gap between GCSE and A Level and develops students’ understanding of descriptive linguistics and literary and non-literary stylistics, together with support for the revised coursework component and new textual intervention task. With rich digital content, this resource is accessible online and for download on tablet devices via the Cambridge Elevate app.